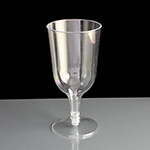 A range of disposable wine glasses in a variety of styles and capacities. Perfect for large outdoor events, festivals, weddings or BBQs as well as indoor events such as parties, conferences and receptions. 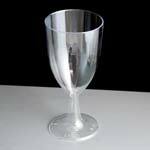 Disposable glasses are ideal for one time use or for where glass washing facilities aren't available. They are very cost effective. 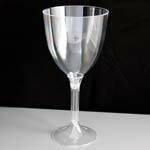 We also stock single use disposable polystyrene wine glasses, perfect for large events right down to the one off party or BBQ. 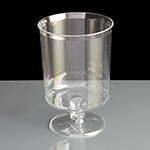 Inexpensive, these stemmed glasses represent excellent value for money; use once and throw away, with no washing up afterwards. These glasses may crack if dropped. 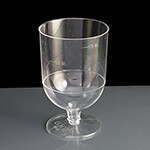 Our MG77 glass is CE marked at 125/175ml, helping to reduce serving time on busy nights. For the home user, our non-marked disposable wine glasses do the job perfectly - why risk your expensive glassware getting accidentally broken?